A Russian shipyard will deliver two new frigates to Vietnam in the summer. 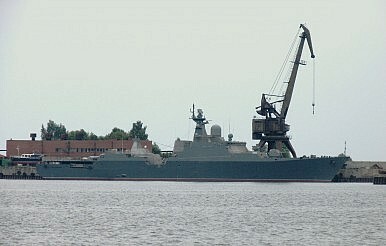 Russia’s Zelenodolsk Shipyard plans to deliver two newly built Project 1166 Gepard-class frigates with a stealth-enhanced ship design to the Vietnam People’s Navy in August and September 2016, TASS reports. The Vietnam People’s Navy (VPN) already operates two Gepard-class ships, the Dinh Tien Hoang (HQ-011), commissioned in March 2011, and the Ly Thai To, commissioned in August 2011. The Gepard-class frigates “have proved their efficiency,” according to the Deputy Chief of the General Staff of the Vietnamese People’s Army (VPA) General Pham Ngoc Minh. The two new vessels are slated to begin basin trials soon. Mistakhov confirmed in April that the propulsion systems (likely a combined diesel or gas propulsion system comprising two gas turbines and a Type 61D Diesel engine) have been installed and related electrical work completed, according to IHS Jane’s Defense Weekly. In June, shipyard authorities admitted that the Ukraine problem resulted in the setback of delivery schedules of the frigates by a year – to 2017 and 2018 instead. They also conceded that propulsion for the Gepard-3.9s was in the process of being obtained from alternative sources through the Vietnamese government. The alternative source sought out by the Vietnam was purportedly Germany. However, it is unclear how far negotiations progressed. Russia has been pushing to indigenously produce M90FR gas turbine engines for its surface warships and awarded a contract to NPO Saturn, a Russian aircraft engine manufacturer, to produce and test the M90FR turbine engine by 2017 (See: “How the Ukraine Crisis Interrupts Putin’s Naval Dreams”). How Will New Subs Affect Vietnam's South China Sea Strategy?Vietnam to Get Fifth Kilo Submarine from Russia in Early 2016Vietnam Commissions Two New Subs Capable of Attacking China Vietnam Gets Fourth Submarine from Russia amid South China Sea TensionsWhat’s in Vietnam’s New Submarine Vessel?